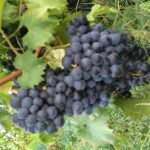 If anyone is interested and in need of a low quantity of Chambourcin grapes for supplementing wine production, please contact me. I will be selling my Chambourcin grapes which presently consists of approximately 1/4 acres worth. I anticipate harvesting approx. 1/2 ton or a little less. I may be picking as early as this weekend depending on the weather. As of Sunday, they were averaging about 20 brix.